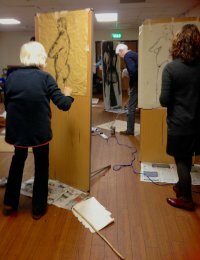 Since 2011 Weymouth Drawing Group has met on a Thursday mornings. Each session starts at 10 am, with the venue opening at 9.45 for setting up and coffee, and runs till 12.30. The sessions are sociable, enjoyable and lively, and suited to a broad range of individual needs and varied levels of ability, even the confident beginner. A stress-free approach to drawing is adopted, in an environment which looks to improve drawing skills. A variety of models are employed and each session responds to the model and the group dynamic. Discussion of drawing styles, history and practices are structured into each term. There are plenty of tables and chairs at the venue and some drawing boards. You can also bring your own easel, if you have one. There is free parking at the club to make bringing larger equipment possible. You will need to bring your own drawing materials and paper. For those new to life-drawing charcoal or pastels are very forgiving when used on very smooth paper. Tea, coffee and biscuits are also available in the short break. There is a flexible booking process with a reduction for advanced payments and booking of the 5 session course, making a two and half hour session from 10 am -12.30 only £13.60 each @ £68 for the course. A saving of £27 in total when booked in advance. However, everyone is welcome and you can turn–up on the day and pay £19 on the door.